Coulter-Nile is set to undergo Tests for a bad bout of vertigo which he suffered during the Big Bash League on Saturday. Australia fast bowler Nathan Coulter-Nile is set to undergo Tests for a bad bout of vertigo which he suffered during the Big Bash League on Saturday. 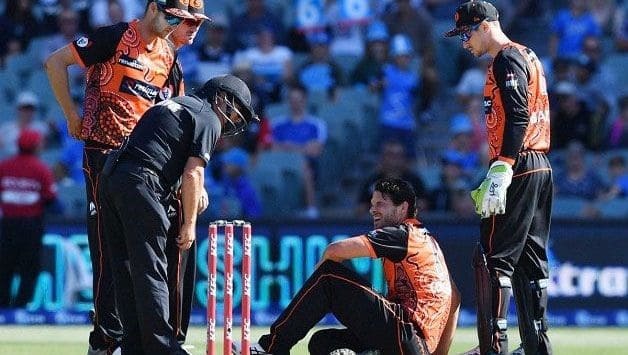 Playing for Perth Scorchers, Coulter-Nile sat down on the ground after bowling the his over, the 18th of the match against the Adelaide Strikers and had to be rushed to the hospital. “They put him on an IV drip and he was feeling well enough to travel with us today, which is good,” Scorchers coach Adam Voges revealed. “It’s something he’s had before in the past. It’s normally taken a day or two for it to settle down. Hopefully that’s the case and there’s nothing more sinister than that. “It’s very random and came out of the blue. I’m just glad he was discharged from hospital last night. He still doesn’t look great and he’s not 100 percent but he’s certainly feeling a lot better than he was and I’m sure he’s glad to be home. Coulter-Nile is part of Australia’s tour of India later this month, where they teams play five ODIs and two T20Is starting February 24. 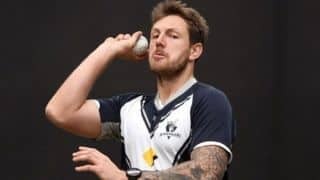 The 31-year-old expressed his desire to feature in Australia’s World Cup squad, and provided he can recover in time for the series, Coulter-Nile would try and push for a berth as Mitchell Starc and Josh Hazlewood continue to recover from their respective injuries.